Read ModKat Cat Litter Box reviews by customers. We decorated our spare bedroom and had the floors sanded so we did not want a standard litter tray anymore.2 of our 3 cats took to it immediately, one is 17 years young and navigates its easily. Some tiny bits of litter does escape on their paws but definitely not as much as before and never clumps like before. I am currently pregnant so this was a gift of sorts to my Hubbie, but I think its a safe option for when the baby comes also esp when a toddler. We are already considering a second. I think I could write a PhD thesis on cat litter and litter trays, having tried almost every type and model going, in an effort to reduce the number of hours I spend every day sweeping up spilled litter and attempting to keep the house smelling nice. At last - a solution! No spills. No smell and even my large ragdolls fit inside easily. The price made me cry a bit, but it is worth every last penny. I have cats at home for many years and never have been able to find a litter box that kept the litter in, that was compact but roomy enough to accommodate my cat, that looked acceptable in the home and was easy to clean. FOUND IT. Modcat litter box is superb. Zooplus already sells it a discounted price and now it's discounted again for black friday...buy it....you will not regret it. I had to find litter box suitable for current apartment size since the previous one was too big and I have heard only good things about Modkat. My only concern was that how my two cats will learn how to use Modkat's box. Fortunately the learning took 5 seconds and my cats were into it right away. The litter box is quality product and also litter sand friendly - before the cats would drag the sand all the way to bedroom and it could be found from everywhere. With Modkat, the litter sand is now either on top of the box or very close by. I sincerely recommend this product to all cat owners although the price is expensive, it's still the 'iPhone' of litter boxes. Best litter box our there for smaller cats! Our three cats (2-4 kg) absolutely loved this from day one! Easy to clean, stylish, good quality. Keeps litter in the box. Sadly, too small for large cats (8 kg and up). I bought one of these two years ago because I liked the top entry design and overall look and solid build (if not the very hefty price tag...). All four cats tried it; one used it for a while fairly consistently when young, then all stopped using it given any other litterbox choice (and two refused to use it at all). I think the main problem is that the space inside is very small and cramped for many cats, especially larger toms. I just dragged it out again to try to get two new kittens to use it so that it wasn't a total waste of money. To me the key point was that given the choice of several types of boxes in the house, cats preferred other form factors and not this (even when it was swapped around by location). I'd consider a larger and lengthier shape but to be honest, for a fraction of the cost it's easy to do a hack with a storage box and lid, with an opening cut in the lid... wish the cats had liked the box more as it is attractive in a world of ugly litter boxes. Purchased the Modkat after much deliberation and when my kitten Bear came home before he could even use the Modkat I rushed out to buy a normal one as I didn’t think that at 12 weeks he would be able to climb into it. I placed them side by side to give him the choice and when he went to use the toilet he jumped straight into the Modkat. I was extremely relieved considering how much it costs. However it is worth the purchase price. It looks good. It is easy to clean. It gives Bear privacy. The cat litter I use Oko Plus works well with Modkat and I don’t get very much mess around the box. Many people who come into our house are not aware that it is a cat litter box. If you are debating whether to spend this much money on a cat litter box then I would recommend that you do. great product but too expensive! I was quarrelling a lot with myself to buy this ridiculously expensive toilet but now that I've done it I have to say I don't regret it. - My Russian Blue kitten loves it, had to try it "litter"ally immediately after I set it up. My other cat was a bit suspicious at first but late in the evening I heard him sneaking in there as well. - It's extremely good looking, the main reason for me to buy it in the first place, but: - Best of all, no spray litter anymore! The grid works quite well. And even though they sometimes jump directly to the floor out of the box in a funny parabolic jump, nearly no litter is flying around anymore. If you put the box in a corner with the hole facing the corner, the parabolic action is not possible anymore so they have to jump on the grid. I was a bit concerned the cats wouldn't cover their poo properly in that box but they manage just fine. It's big enough for both of them, even my big shorthair tomcat, to maneuver sufficiently. Can't understand the price though. I'd bet a lot more people would buy it if it was around 85€ - 100€ which would still be expensive but at least much more reasonable. Only four stars, and that's only because of the price. The product itself is amazing. Altogether very happy with it. Not the best on the market for the huge price tag. The button snapped on one of the boxes I had. Only had it a few weeks. I got a replacement lid eventually, had to wait 8 weeks, no offer of a refund which I would of preferred ideally. It's just not that good. Finally swallowed the bullet and purchased the ModKat, I was worried after spending the large amount for a litter tray that my furry babies would not like or worse still would not use it...how wrong could I be...it came well packaged, yes it's pricy but the build and quality of plastic is excellent, I filled it immediately with litter and I couldn't believe my eyes, within less than 2 minutes my first cat Otto was in for a quick twinkle and then as if cueing to use the new toy my second cat Lucia was straight in for a no2, no complaints from the Cats!! I have to say the design is fantastic and looks very smart but my main reason for purchasing was I am sick & tired of constantly sweeping up litter, I have had it now 1 day, I came down this morning keeping all fingers and toes crossed that it would be at least an improvement from the normal paper mill I have to sweep up to feeling very smug with myself as there was not one piece of litter on the floor, sad I know but I am delighted with this purchase, really wish I had bought one earlier. Best litter box for looks and use! With 5 house-cats (with the added access to the garden which has cat-proof fencing so they cannot get out & come to harm). We have 3 hooded litter-boxes in the garden. However, one of our little babies is very attached to us & does not like being around the others over night. She likes to sleep with us, or on the landing with our bedroom door left a jar so she come in & go out as she pleases. However, with no litter-box for her to relieve herself over night, there has been one of two..or three, accidents before now. Even though she is generally very good - we put her out in the garden to go for a last toilet-stop before she comes up with us - at times,as you know, nature calls at odd times! So, I decided to bite-the-bullet and buy her a litter-box to put in the bathroom for her to use over night. Every litter-box is designed to look so ugly and so when I saw the 'Modkat' I was wowed! My first thoughts were "That looks really cool for a cat-toilet", my second was....."How much?"... I began reading every review on-line I could find, until I was convinced that this was a worthwhile purchase & a justifiable one. So, I ordered it from 'Zooplus' at £114, & it arrived yesterday (3 days in all & that was over the weekend, and coming from Germany - I think!). I set it up in seconds, placed it in the bathroom & poured about 2 litres of Catsan in it. I left it and waited. On a visit to the bathroom last night I stopped and sniffed ,& as I walked in I thought...."Humm.......".......Martha was sat there looking very pleased with herself and the evidence was in the box! :) She used it first time, no quibbles and I was able to deposit her 'deposit' straight down our toilet....how easy is that!! I love how it fits in with modern decor and doesn't look like a cat litter-box, but you obviously soon work out it is ;) It is actually a talking point, as I heard one of our guests use the loo and say ..."Wow", as he walked in. This is seriously i-products for cats! ^~^ The only real downside for me is the blue liner, why blue??? They have designed something very classy & minimalistic & then tarnish it by putting a blue liner in, which looks like a fish pond-liner! Now, is this worth the money? The construction of the 'Modkat' is of high quality & looks very cool- this is an i-product for cats :D The height & width (although could be slightly wider to give kitty a more comfortable manoeuvre experience) is ample enough & it's size enables it to fit neatly into a confined space. The top entry is big enough for kitty to ease in & out comfortably. The holes in the top are very good for trapping any litter left on kitty's feet & it drops back in, or you can brush it back in using the brush on the side of the scoop. So yes, no tracking of litter! It is so easy to clean. The reusable liner is strong & durable & easy to lift in & out for cleaning. My new kitten has been with us for two weeks and as soon as I removed his normal litter tray he used it! It prevents smells and looks cool in my kitchen. We are all very pleased with it. I am sure it will be worth the money but I would like to see how I feel in a years time. It feels sturdy enough to last and be well worth the money. I am going to get another one for the room where he sleeps. This litter box is super MOD! I really like that you can't tell what it is on first inspection and my cats took to it right away. I see comments regarding not being able to find the liners anywhere, I contacted the modko company and they told me they now have an EU site to buy liner and I checked and they do! Very excited!! Yes: this thing is expensive. It was probably financially foolish of me to buy it, but I am absolutely glad I did. It feels a little weird to actually be excited about a litter box. The walls are high enough that my cat does all her digging and scratching inside the box (before she used to scratch the walls) and none of the litter gets tossed out. I use wood based litter, and that stuff tracks like crazy, but the top-entry system and the holes in the lid mean that now there is virtually zero tracking. The hinge on the lid makes it easy to lift it up and remove any, er, solid waste, and the liner lifts out easily and makes it easy to change the litter. My cat is pretty chunky (16.5lbs, most of it pudge), and she fits through the hole with no issue whatsoever. I live in a very small flat, and the fact that this keeps everything contained (and looks good!) has turned out to be kind of a big deal. I'm surprised that there are no copies of the ModKat on the market. To be honest, this box is a major relief from tracking, spilled litter, smells, painful cleaning, etc. etc. And cats love it. It took me no time to train my two kittens to use it. And the time it saves in cleaning litter that has been thrown out of the box from aggresive digging is well worth the price. Looks good from a far but when you actually look at the edges it is poorly formed with flaps of plastic around the rim and handle which is also a bit discolored... feels a little like cheap plastic and doesn't feel of the quality as i had expected for £129.99 but i haven't had to sweep up any trailed litter in a week which i was doing before twice daily so for that i would say overall is worth the buy. Zooplus were very helpful when we were buying Modkat and I am Very happy with my purchase. My two ragdolls got in to Modkat as soon as it arrived and immediately used it. It does considerably reduces the mess with one of the cats who loves to sit on the top. The other one tends to jump out without climbing to the top lid. Even without climbing to the top first, most of the litter is shaken off during the jump back to the box but some does escapes. Modkat looks cool and is very functional. Might consider buying another one to replace the second litter. I had to Google this cat litter tray, and look at many, many pictures images before I could order this hideously expensive item. Upon looking though, i had to conclude there is just nothing to compare at all. Litter trays are just so ugly, there's no doubt about that! It was going in my living room, and i couldn't bear looking at it for years (have an indoor cat). Upon arrival, it was love at first sight-yes for a litter tray! It looks fantastic next to my black gloss media unit, and looks so stylish.It feels well made, so would disagree with any reviews that say it's flimsy, it's not. Now, more importantly would my 10 week old kitty like it? Well, after struggling to get in, and then falling back a few times struggling to get out (was a bit worried watching her to be honest...) she then mastered it. A week later and she is in and out with ease, and loves it. She still goes in for a dig sometimes, and jumps all over it. Easy to clean,and with OKO cats best litter,very hygienic. I love it! A winner for all of us. Functional and smart, this does exactly what I wanted it to. Apart from the unfortunate surprise when I opened it - it was yellow, and I ordered black - the kittens used it within minutes of it being set up. They seem to like using it and it's made my life easier. Saving up for a second one, so I can get rid of the front entrance tray we have. Ps the yellow is not too bad, and I was too impatient to return it! I have had my Modkat for quite a long time now and I would never buy any other litter tray! I thought I was going mad when I bought a litter tray for so much money but I am so glad that I did. I have two cats and I was a little worried that they wouldn't use it. However they both just popped in! I like it because my cats can dig in the litter without leaving a huge mess! There is a little tracking of litter but not very much. I bought a second liner and swap and wash the liners every couple of weeks. I just want a pink one now!! I have had cats for years and over them years have had numerous litter trays but they have all had the same problem they all leaked. Now i have found the solution - no more cat urine leaks and also looks good as well. Yes abit pricey but for me and my cats it's worth it. I bought one of these thinking they were really expensive but went off the reviews on here, I was not disapointed, it really reduced the litter comming out of the tray, so much so I got a second one. Love them, really worth the money to stop the litter tracking all over the place. Great for keeping small dogs out of the litter! Admittedly, I was reluctant to spend this much money on something made from plastic. (Kudos to the ModKat marketers for this.) Nonetheless, after years of our dogs getting into our cat's litter to feast on his feces, I was fed up... so I bought one of these. I worried that it would be another failed effort to keep them away, but it has done the trick. We've had it for two weeks now and it has changed our domestic lives dramatically. No more worrying about cleaning up the litter right after the cat goes. We can even leave it overnight (yes, we did an experiment to see if the dogs could get into it in the night--they couldn't). Our dogs are small, around 9kg, so it possible a big dog, like a greyhound, would be able to stick its head in and continue feasting... so it may not be a solution for large breed owners with this problem. I was also worried the dogs would tip the container over, but they haven't. It is quite heavy and seems to stick in place. I was also pleasantly surprised to see that the grate at the top actually works for catching litter. Our cat is a notorious digger and we used to need to vacuum twice a day to both collect the tracked litter, as well as the pet hair in the house. I'm pleased to say that the litter tends to stay in the box with a few stray pieces landing right outside when he jumps out. The only thing that seems silly to me is keeping a scooper on the outside of the box. We leave ours in a bin next to the toilet just as before, because honestly, that part seems a bit unhygienic. Overall, I'm very happy with this and I have found it was worth the money. I bought this because my 10week old kitten was scattering litter all over the place and then trailing it all through my flat. I have a really small flat and nowhere I could obviously store a large hooded litter box without being unsightly. I opened the Modkat about an hour and half ago. It certainly seems easy to change and clean. I let Martha watch me fill it up and add some litter from her old tray. Then followed an anxious time - Martha spent much of this time siting on the top and looking inside anxiously; I spent most of it anxiously waiting to see if she'd go inside (while pretending not to) because, while it's attractive for a litter box, I don't really want what, if she doesn't use it, is just a very expensive blue box. And success! She just used it, had a good dig around and then popped out...with no litter on the carpet. I'm not convinced it will be 100% effective at containing litter that gets on her paws but it certainly contains that which she throws around. Negative points: 1) no filter - while it does contain the smell reasonably well it's not smell free 2) even though I knew the dimensions it still a lot bigger than I expected though I suppose it needs to be big enough for a large adult cat 3)not convinced I'd want to use the scoop and then just hang it there on the side when it's possibly not entirely clean. Despite these small things I would say that overall I'm very happy with it. It looks a lot better than a standard tray and seems very effective at containing the litter. So, I have two previous reviews about this box, as I love it, but was disappointed with the lid design as the button you press snapped off both my boxes. I got two new lids as replacements and the button design is now altered so if it snaps off again they don't have to send you an whole new lid, just the button itself as it detaches now. Maybe the new lid design is standard for these boxes now. I would hope they last longer than the old design did... Still wouldn't use any other litter box. Happy to have working lids. The price of this box is enormous but I think the amount of work it saves makes it worth it for me. My cat is a digger and kicks litter all over the place when using a traditional tray. Hopefully he'll be around for another ten years at least, and this litter box can prove its worth. I got a blue Modkat recently for the bathroom as we wanted a litter tray that looked nice, was easy to clean and would help prevent tracking. The modkat certainly met all of those requirements and my selkirk rex loves it. I also have two ocicat boys who use it, although it seems a little cramped for them. No problems with the button yet - I've had it a month and the liner is starting to wear but it still works perfectly for now. Just bought the yellow box two weeks ago and our cat used it straight away. No problem at all. It's very easy to clean, just flip the top. No hassle with removing the top. Good use of space and looks nice. Toilet cleaning no longer a hassle...lot of money but after evaluating pro and cons, worth it. This has the paw vote! After 2 weeks, I had to remove the old litter tray next to the Modkat box then wait with baited breath. Finally, my cats used the modkat litter box and have voted with paws raised! It is very stylish in looks (I love it! ), there is a definite reduction in the amount of litter that goes on the floor and it's very easy to remove the clumped waste (I don't even need to tilt the lid, it probably helps that I use the worlds greatest litter though). I'm so pleased I'm going to buy another one. The only downside is the brush that comes with it, as other reviewers have said the brush bit ends up in the litter when you're trying to scoop out waste and I wouldn't want to attach a dirty scoop to the box so I use a different scoop. Our two 12 week old kittens took to this straight away. Being only babies they were kicking the kitty litter all over the show in their old box and making a right old mess, so although this was a pricey purchase, it's been worth it's weight in gold. Very little litter escapes, and even at 12 weeks our two knew what to do with it straight away - no accidents in the transition, which was a better start than we expected. Yes it's a lot of money for what is essentially a plastic box, but this is an attractive item in the home and I have not yet seen a similar design on offer anywhere else. Expensive? Yes. Worth it? Absolutely. I left it a few day's to write this review. The litter tray is an excellent design. It looks good in the room and is easy to clean out. As long as you put the hole side into the corner of the room you get very little on the floor. I wouldn't say it has got rid of all litter on the floor but I suspect it may make a difference to what litter you use and how easily it comes off their paws. For hygeine reasons I would definately recommend this product. I did buy it on offer and got an additional 10% off due to it being my first order so it was £89, I think the price is a little steep but it does make your life a hell of a lot easier. No more mess on the floor! Have had this for a few weeks before writing the review. Very pleased with this product, despite what seems a high price for a litter tray. I have cats who go mad trying to cover their mess - usually sending the cat litter everywhere without covering anything! With this, which they took to straight away, they can go mad as they like and nothing escapes. What a great idea the cleanable liner is - easy to clean, very strong, etc. Can't recommend this highly enough. I first saw this litter tray a few months ago and liked the look of it. I am a sucker for things that look stylish as well as do what they are supposed to do so thought i would give it a go. I had a large hooded tray but i was getting fed up of not only cleaning out the bottom and my cat tearing at the filter, but also having to clean all inside of the lid too which held a strong smell of urine. I was unsure at first about using a reusable liner as i like things to be hygienically clean and i had visions of the bottom of the bag getting...well i wont say. lol anyway my modkat tray came and i (sadly) couldn't wait to fill it with cat litter and see how my cats reacted to it. I needn't have worried as they took to it straight away.I had originally got it for our new kitten and kept the hooded tray for my cat but he saw her using it and quickly joined in. The tray is large enough for my cats and my kitten. The reusable liner clings to the inside of the tray which makes for a perfect fit. What i love the most about the tray is how easy it is to clean. The inside of the tray I give a quick wipe round with soapy water and rinse after i remove the liner but there is usually no need for this anyway. A quick wipe with a wipe will be sufficient. The lid easily flips up or can be slid out to be wiped over. There is never any smells coming from it. I know as i put my nose by it to make sure it is clean! lol The liner you just empty out and again clean over it or wash it out. The mess seems to just magically empty out and doesn't stick to the bottom of the bag as you may expect. There are no fiddly clip parts or handles to have to clean with a toothbrush or that gathers dust as my old tray did. My other tray also looked grubby on the outside as the material stained. The modkat is made from a nice smooth non porous material that stays clean and can be wiped over with an e cloth or damp kitchen roll. I love the little brush that hangs on the side for visual reasons but admittedly i don't use it as I wouldn't want it hanging on there after using it to scoop kitty poop so i use a seperate one with no brush, but it can be used to just dust the top of the lid that traps bits of litter in as by the way, the holes in the lid keep litter to a minimum that gets tracked onto the floor. They really do dust off any bits of your cats feet. Needless to say, I no longer have my hooded tray now and I am purchasing another modkat. If you love things that do what they say, is simple to clean and looks stylish then this is for you. Yeah it's a little on the pricey side but the simplicity of it and how it makes what was a fiddly job, a much easier task then i am all for paying a bit extra. very clever idea, the cat litter falls off cats feet into the box as they climb out and not all over the floor, my sphynx cats love the privacy, It looks great not like a litter box, my cats took to it straight away, I would highly recommed, A little on the pricey side but great when on offer, but still worh it good colour choice, wouldnt buy normal litter trays ever again. Got rid of old normal litter boxes and now have two of these Modkats in different colours. I've got a tiny bathroom and can still fit two of these next to/under the sink. Perfect! Cats have no complaints either :) I use it with "World's best cat litter multiple cat" and just flush away the clumps. So easy and fast!! No litter spills at all, it's quite amazing. Such a relief not to have to constantly clean up litter all over the floor! I find the scoop very good, the big holes in it means you sift thru the litter fast, which I like. Works very well with the litter I use anyway. Never going back to old-type litter box. We purchased this as we thought it looked nice. The design is wonderful - it looks stylish (it is a bit large) and my cats love it, they prefer it to the other litter we have next to it. It gives the privacy to the cat using it and it allows you to put quite a bit of litter in it. On the negative side - and this in no way is anything to do with the design...my cats still spill some of the litter out (not as much), the scooper is great and has a little brush on the side but sadly I find it too big and the brush gets in the way when scooping poop and gets dirty therefore. On the whole I think a lot of thought went into this litterbox. Both my hubby and I love the design, it is novel and it does stop litter being strewn about due to gravity. Mine two sometimes leap out without jumping on the shelf, which then spills a bit but overall it is good litter box. Not sure if it warrants the price tag. I was initially put off by the price, until I bit the bullet and had it delivered then realised its absolutely worth the cost. 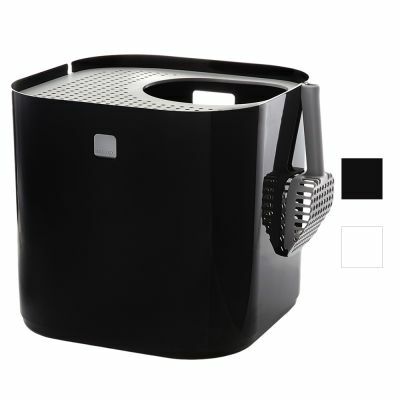 It's extremely well designed and has all but completely eliminated the daily chore I had of sweeping litter up that our insane Abyssinian had flicked everywhere. The cats took to it straight away with no hesitation and I'm very glad I bought it. The supplied scoop is the best I've used and looks great clipped to the side of the box. A great product albeit quite expensive. we have been using our modkat for just over a week now and so far it has been a huge success. our two british short hairs were a little confused for a few hours as they had only ever used a basic tray but they worked out what had to be done and were soon using it like pros. our litter tracking problem is now solved as nothing comes out. its easy to clean and looks great. well done zooplus for acting upon the suggestion to supply the replacement liners so quickly as that was also a concern that we had.